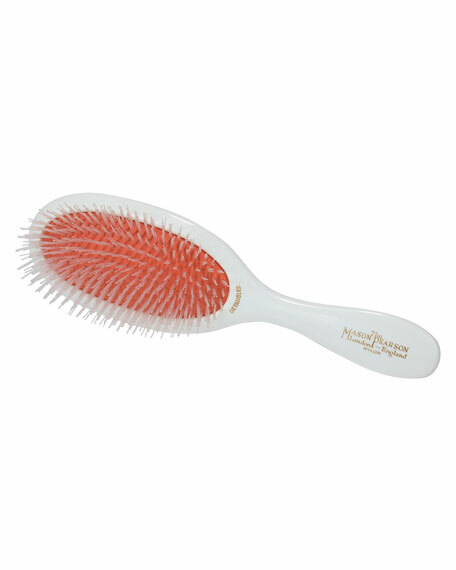 The Mason Pearson Hairbrush cleans the hair and stimulates the scalp, increasing blood flow to the roots. Considered the universal brush and should be used with all other Mason Pearson brushes to complete the "Mason Pearson Healthy Hair Regime". To be uses before and after shampooing. A classic "barber's" comb used for cutting hair, it features a straight line of fine, short, teeth. Mason Pearson combs are handmade from the finest celluloid material in the world. This is the same material used to make designer costume jewelry, hair ornaments, and eyewear. The Mason Pearson Hairbrush cleans the hair and stimulates the scalp, increasing blood flow to the roots. Contains bristle & nylon tufts. 8 1/2 inches. 2018 InStyle Award Winner for Best Paddle Brush The Mason Pearson Hairbrush cleans the hair and stimulates the scalp, increasing blood flow to the roots. Contains bristle & nylon tufts. 9 inches.